Galatasaray outplayed Besiktas across the pitch – and were rarely troubled even after Felipe Melo’s red card. Fatih Terim was without right-back Emmanuel Eboue and left-sided midfielder Nordin Amrabat because of the Africa Cup of Nations, so played Sabri Sarioglu and Emre Colak. Johan Elmander started rather than Burak Yilmaz, and Wesley Sneijder was only on the bench. Samat Aybaba was forced to cope without striker Hugo Almeidia, which meant Filip Holosko was pushed upfront to play as a lone centre-forward, and Roberto Hilbert was moved forward to play on the right of midfield, perhaps to deal with Albert Riera. Mehmet Akgun made a rare appearance at right-back, while Gokhan Suzen came in at left-back. Galatasaray were the better side for the majority of the game, and although Besiktas built some pressure when Galatasaray were reduced to ten men, they never did enough to merit an equaliser. Galatasaray played their customary 4-4-2, although the key feature of the side is the way Emre and Hamit Altintop drift inside into central positions, allowing the two full-backs forward on the overlap, with Riera particularly impressive here. Therefore, Terim’s side dominated the centre of the pitch because of sheer numbers, and continued to stretch the play – the forwards also had license to move wide, and help maintain width and create overloads on the flanks. Predictably, Galatasaray dominated possession, while Besiktas were geared towards playing on the break, particularly exploiting the space in behind the full-backs. With two unfamiliar full-backs, Besiktas were always going to be weak in wide positions. Indeed, it took only three minutes before they were punished, as Galatasaray exploited space on both flanks – Umut Bulut drew wide to the right, forcing the defence to shuffle across, leaving a huge gap at the far post. Bulut’s cross to the far post was converted coolly by Emre, who was completely free with Akgun moving too narrow. One might have expected Besiktas to come into the game after going a goal down so early, but they stuck resolutely to their strategy of defending deep then breaking quickly. Galatasaray, for all their midfield dominance, remained committed to attack, and Melo, often the free man, spread the play nicely from flank to flank. Besiktas were let down by a particularly poor game from Manuel Fernandes, who should have led their pressing without the ball, and helped drive them forward on the counter-attack. Unfortunately, he played neither role well – and though he provided a couple of decent moments with his set-piece delivery, even that was inconsistent and frequently infuriating. Fernandes’ problem was that he didn’t know his role without the ball. He was unsure whether he was supposed to be moving forward and helping Holosko close down the opposition centre-backs, or dropping deep into midfield. Instead, the same pattern happened a couple of times – he’d stay in midfield, Galatasaray would keep the ball in defence, so then Fernandes would move forward to close down a centre-back. However, neither of the central midfielders would back him up and close down Melo, so Galatasaray could play a simple forward pass into midfield, and then look to build an attack. Their second goal arrived just before half-time, with Riera heading in a set-piece. With the ball, Fernandes simply played poorly – sloppy passes and poor decisions on the break. Besiktas only had one significant first-half chance, when Hilbert stormed forward to get on the end of Olcay Sahan’s pass – but he was the wrong person for the opportunity to fall to, and he shot tamely wide. Sensing that Akgun was the problem at right-back, Aybaba removed him at half-time – his second start this season, and the second time he hasn’t made it to the second half. Hilbert returned to right-back, Necip Uysal went to the right of midfield, and Oguzhan Ozyakup came on in central midfield. Besiktas were much more balanced, which makes you wonder why they didn’t start that way in the first place. Tomas Sivok headed in from a corner shortly after the break. Then, the second half became about Terim reorganising. With Sneijder ready to make his debut, Terim moved to a more cautious 4-4-1-1 system, taking off Emre and Bulut – the duo who had combined for the opener – and introducing Engin Baytar in midfield, and Sneijder behind Johan Elmander. However, just four minutes later Melo was dismissed, leaving Terim short in midfield. Therefore, he then had to remove Elmander to bring on another midfielder, Hakan Balta. 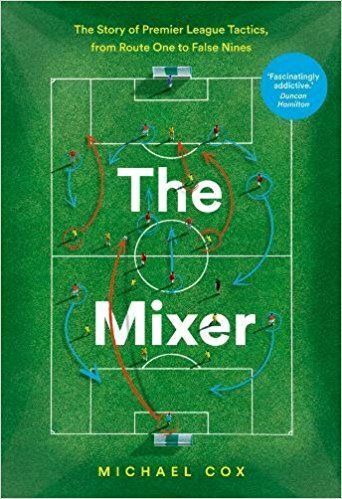 Galatasaray were now 4-4-1, with Sneijder forced to spend the vast majority of his debut in an unfamiliar lone striker role – although he predictably moved deep and linked play – the home side effectively played no striker, and kept the ball nicely. With Terim’s substitutions wiped out in the space of ten minutes, and Galatasaray down to ten men, Aybaba’s side should have taken control of the game. Having already made the half-time change, then brought Dentinho on for Sahan, Aybaba’s final move was predictably a second striker – Mehmet Akyuz – on for holding midfielder Veli Kavlak. 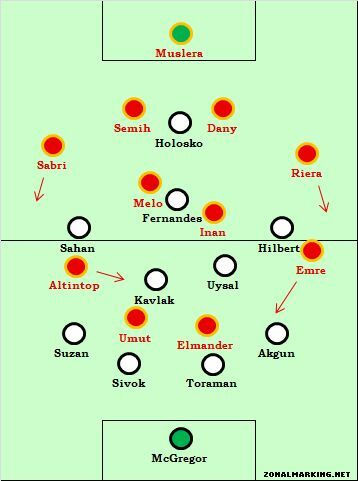 But Galatasaray’s defensive shape was decent, and the way Terim used his bench meant the structure of his side was unchanged – they didn’t have anyone to hold up the ball and get the side up the pitch, but the rest of the side kept possession and Besiktas were unable to press effectively. Too many fouls spoilt the final 20 minutes, a late surge from the away side never arrived, and Galatasaray eventually recorded a rather boring victory. Ultimately, an underwhelming game and a tame tactical battle. Galatasaray moved their wide midfielders inside, asked their forwards to provide width by working the channels, and pushed their full-backs up the touchlines. Their early goal confirmed their dominance, and Besiktas lacked either the pressing or the counter-attacking ability to turn the game around – from then, set-pieces dominated. Now, attention turns to how Galatasaray will use Sneijder and Drogba. With Drogba and Sneijder Galatasaray will most likely knock out Schalke in CL. When they played Man Utd without these two Gala looked solid. Thank you for covering Turkish Super Lig from time to time. Was a great read. You see how Turkish league is more big league now with these names that they transfered, Drogba, Eboue, Sneijder. They will defenitivly knock out Schalke and also need Drogba back from African Cup ASAP. Wow, I had no idea Riera was a fullback now. How is he defensively? Perfect analysis of a very tactical game. Thank you, ZM! Shanghai Shenhua want to contest the deal, and unless it really is true that they own Drogba pay over a sustained period of time, there’s no way FIFA will allow the transfer to go through. FWIW, I think he will at least be allowed to go on loan, since it’s clear he no longer wants to stay. The Chinese club can talk all they want. Drogba terminated his contract on the 16th for not getting paid for three months. I know you asked not to do ask for specific matches. But you have to cover yesterday’s Classico. Not because this is most watched match in the world. Not because this are two best teams in the world. But because yesterday’s game was groundbreaking in terms of tactics. I think Mou has finally found a formation(4-2-4) that will give answer to Barcelona dominance. As you concentrate on tactics, I think you must cover tactical aspect of this match. Thanks for you interest to the Turkish football. 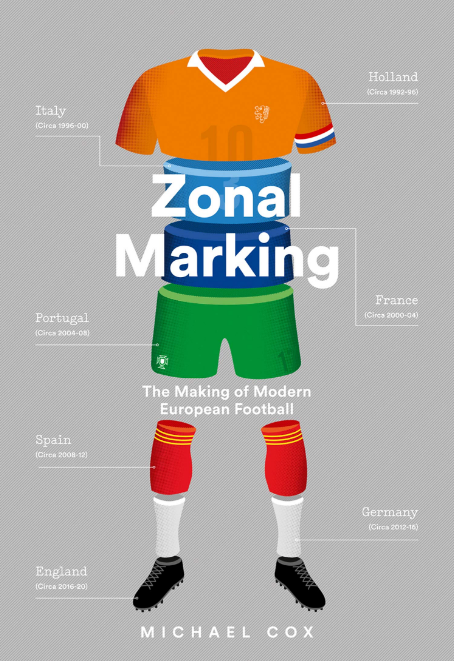 As a devoted fan of Besiktas, and follower of your site for almost 2 years, I must admit that I got very excited to see a Besiktas match analysis in here. Unfortunately that was a poor match. Besiktas’ height problem was explicit. The idea was to break GS attacks earlier with Holosko, Sahan and Hilbert pressing up, yet the distance with the lines were huge and the instinctive play of Toraman to play deep led the team not to press well. Also the team tended to play like the lone forward was a target man like Almeida, which was contrarily Holosko-a wide forward who needs space-. Fernandes hadn’t been playing for 2 months and was unfit, yet Aybaba inconceivably kept him 90 minutes on the pitch. On the contrary to Galatasaray’s attacking power, their defend generally seems quite weak and destructible, though it was not visible at this match due to the lack of attacking power of Besiktas. I think it’ll be better tested in the Champions League.